Cache is a small storage location of computer system that contains data that is requested or computed earlier. If user requests again for that data then cache enables to provide it faster. It is much useful component of computer system but when cache becomes full then it reduces the system working efficiency. In this situation, it needs to be cleared time to time. I have explained an article to clear cache of all type on windows 10. You should know that cache is of two types; one is Desktop app cache and second is Modern UI App cache. First process – All cache can be cleared by a simple manner, for which you have use CCleaner software which clear all types of cache by a simple click. CClearner software is available on above given web link. Second process – In this process, you have to clear all types of caches manually one by one using cleanup method available on computer system. #. 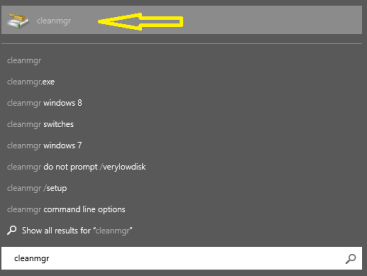 Click on Start button and type cleanmgr in search box in start menu to open Disk Cleanup. #. Now Cleanup window will appear on screen, scan files stored in different drives on your PC. #. Select appropriate drive and click on Ok.
#. Files to be cleaned up will be on screen, check all boxes and click on Ok. Note – All essential details related to this article and remaining matter are available on above given web link.